Every year in the month of June Florence relives an important piece of its history. There are in fact the semi-finals and the final of the Calcio Storico Fiorentino (Historical Florence Football), a sporting discipline in costume that dates back to the 16th century and to which many attribute the origins of modern sports such as Football, Soccer, Rugby, and even Wretsling. The four teams that compete every year represent the four historic districts of Florence: Santa Croce (blue costume), Santo Spirito (white costume), Santa Maria Novella (red costume) and San Giovanni (green costume). The matches take place in Santa Croce Square, for the occasion transformed into a sand field surrounded by the stands for the spectators. Each team consists of 27 'calcianti' (footballers) divided into roles such as: 4 Datori Indietro (modern goalkeepers), 3 Datori Innanzi (modern full-backs), 5 Sconciatori (modern median or midfielders), 15 Innanzi o Corridori (modern attackers and strickers). 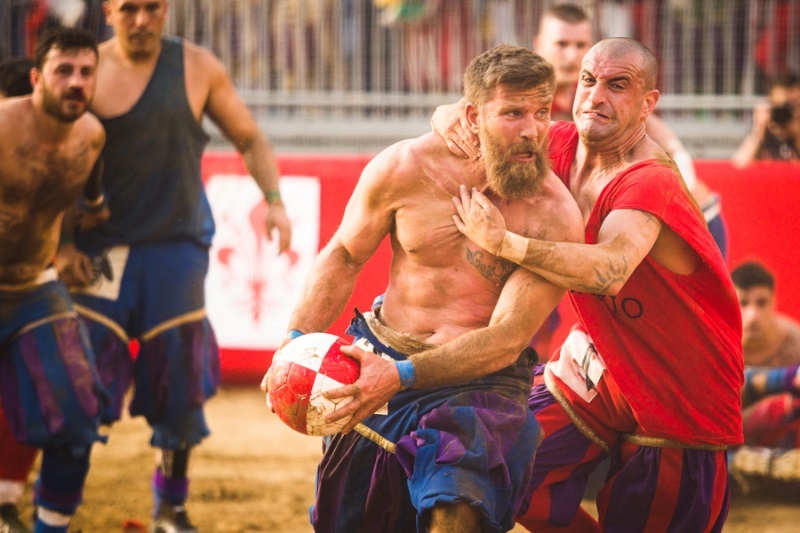 Attending a game of the Calcio Storico Fiorentino is a unique experience that Residence Hilda recommends to all guests! For those lucky enough to attend the final game of June 24, we remind that this is always a celebration day for Florence city: before the final match which takes place at 5pm, there is the traditional parade in sixteenth-century costume that crosses all the streets of Florence historic center from Piazza Santa Maria Novella to Piazza Santa Croce. The final in fact, is traditionally held on June the 24th, the day of San Giovanni saint patron of Florence, which culminates with the magnificent 'Fochi', fireworks fired over the Arno river from Piazzale Michelangelo. Experience the history of Florence in June ... at Residence Hilda!